In South Florida, an air handler is most often used just for forced air distribution of central air conditioning. The common air handler is a cabinet with a blower and controls. 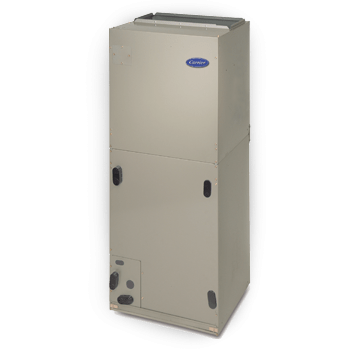 However, electric heat strips, breakers, and heating controls can be added as an option to a standard air handler to provide heat in the winter. The addition of a heat strip turns your air handler into an electric heating system, with air conditioning capabilities, for year round comfort. At Lindstrom Air Conditioning we offer Trane air handlers, equipped with a variety of heat strips, and are available with single, multi or variable-speed motors. Variable-speed air handlers are known for soft starts, high humidity control features and selectable levels of airflow capacity. Available with either single or variable speed motors, Trane air handlers make a significant contribution to the overall efficiency of your system. That’s because the more efficient your air handler is, the less work your outdoor unit has to do to make your home comfortable.